LAKELAND – Florida United Methodists embarked on new adventures in disciple-making this year, reaching out to young adults, exploring fresh ways to “do church,” developing a variety of programs to nurture clergy and more. Joan Ricks of Trinity UMC, Gainesville, is among hundreds who turned out to celebrate the opening of a satellite location for Florida United Methodist Children's Home. File photo. 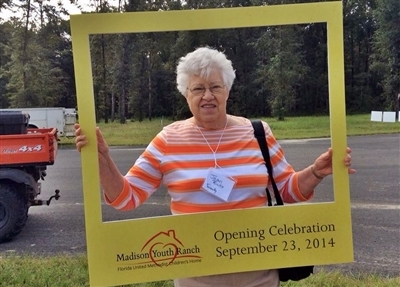 Madison Youth Ranch: The Florida United Methodist Children’s Home near DeLand realized its dream of opening a residential satellite location in Northwest Florida. The first phase, including two residential buildings able to house up to 24 children, opened in July. With 300 acres, there’s plenty of room to expand, and the goal is to house up to 100 children there eventually. Click here for the story. Fresh Expressions: A Florida Conference design team began exploring ways to tap into Fresh Expressions US, an American movement based on an initiative that started in Great Britain. The idea is to explore new ways to reach people who have never been to church or have stopped going and who are unlikely to gravitate toward a traditional church setting. Click here for that report. YAMM director Heidi Aspinwall said the conference already is accepting applications for next year’s young adults to continue the program. Details about housing and mission locations are still being worked out. Check out YAMM’s Web and Facebook pages. 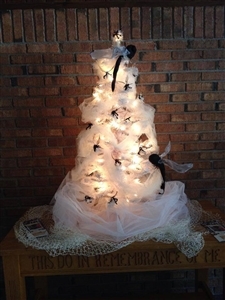 Lake Panasoffkee UMC members crafted this Christmas tree of protective mosquito netting to promote the Imagine No Malaria giving campaign. The church is one of 450 Florida Conference churches to show support for the drive. Photo from Imagine No Malaria Florida. Imagine No Malaria: The Florida Conference officially joined The United Methodist Church campaign to end deaths from malaria by hiring a field coordinator for the local effort, which continues until the end of 2015. Since the campaign kicked off in June, more than 450 churches have participated through advocacy, fundraising or prayer, reports campaign coordinator Kylie Foley. As of mid-December, United Methodists in the Florida Conference had pledged to save more than 60,000 lives. The goal is 250,000. “As we look to 2015, churches who have not already started their campaigns are looking at how they can use Lent, World Malaria Day (April 25), Mother's Day, Vacation Bible School, etc., to educate congregants about malaria and how we can be Jesus' healing hands for this preventable disease,” Foley said in an email to Florida Conference Connection. Check out http://imagineflorida.org/church/ and www.facebook.com/imagineflorida for information on the local campaign. Stop Hunger Now: United Methodists in the Florida Conference far exceeded the goal of “A Million Reasons,” a hunger relief campaign that began in June 2013 with a goal of packaging a million nutritious, low-cost meals for impoverished people in the Caribbean. By June 2014, nearly 1.7 million meals had been assembled and shipped through a partnership of the Florida Conference and the North Carolina-based nonprofit Stop Hunger Now. About 10,000 volunteers from 270 United Methodist churches in Florida took part in the effort, which included about $400,000 in donations. Young Clergy Initiative: Florida Conference departments received two grants from a pot of about $7 million earmarked for Young Clergy Initiative (YCI) awards throughout The United Methodist Church. The Florida United Methodist Foundation teamed up with the Florida Conference Office of Clergy Excellence to devise an education program to help young clergy candidates reduce seminary debt. That program, scheduled for March 3-5, 2015, at First UMC, Lakeland, attracted a $50,000 grant. College Connection, a weekend retreat coming up at Warren Willis Camp, received a $14,100 YCI grant. The funding will help defray registration fees for rising college students, including those pondering a career in ministry, who attend the three-day event Jan. 23-25, 2015. Registration is open to high school juniors and seniors at www.warrenwilliscamp.org/college-connection. New Church Start Academy: The Florida Conference New Church Development office kicked off a series of retreats for pastors of new church starts and those trying to revitalize existing churches. The training is being offered by Ashland Theological Seminary of Ohio, which received a Lilly Endowment grant to take a condensed version of its 13-month program on the road. Click here to read more. Training church network: The Congregational Vitality office has begun developing a network of teaching churches to share fruitful ministry techniques with churches in need. Janet Earls, congregational vitality specialist, said three teaching churches are set to move forward, other mentoring churches are in the process and videotaping has begun for an E-learning program. “This is exciting, as we fully develop the connection of our Wesleyan heritage,” Earls said. “Our stronger churches are willing to help the churches that want to progress. The mentoring churches are eager to be like local missionaries and provide guidance and coaching to the churches that want to move forward. On a sad note, the Florida Conference also mourned the death of Bishop J. Lloyd Knox, whose ministry was homegrown in the Sunshine State, starting at Hyde Park UMC, Tampa. Retired and living in Alabama, the bishop died in April at age 85. His memorial service and interment were at Hyde Park UMC, where he learned about Christ as a teenager in the 1940s. He went on to be ordained in the Florida Conference and serve as a church pastor, missionary and district superintendent before being elected bishop in 1984. As bishop, he was assigned first to the Birmingham, Ala., area and then to Atlanta. After his retirement in 1996, he served twice as interim bishop in the Florida Conference.